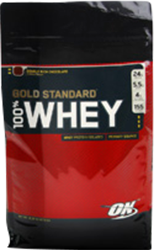 Optimum Nutrition 100% Whey Gold Standard is the leading protein on the market today, as it has been for many years. With a great reputation, high quality ingredients, and a clever, up to date formulation, this comes as no surprise. If you go to a great gym, you're more likely to head over there and work out more often and the same principle applies to a protein – If it tastes good, you're more likely to drink it. While there is no doubt that bodybuilders and athletes put themselves through some serious discomfort in the pursuit of results, the seemingly small matter of protein taste is definitely a very important factor for most people. There are so many proteins on the market that most people should be able to find something that meets their needs and tastes good. Does this mean Whey Gold is the best tasting protein? At Mr Supplement we want to be able to give our customers balanced, first hand advice, so we decided to find out for ourselves. We took three proteins that were similar to 100% Whey Gold and set up a blind taste test to see how the best selling whey on the market stacked up against its competitors. The products we chose were all whey based protein blends, but some contained ingredients like hydrolysed whey protein and casein because we were interested to find out if these ingredients had an effect on our testers' comments and scores. Whey Gold Double Chocolate is one of the top selling flavours, so we decided to conduct our test using the chocolate flavour of each of the proteins. The shakes were mixed according to the manufacturer's directions, and we presented the samples to our taste testers in plain numbered glasses to keep the identity of each product hidden. We asked each tester to say a few words about each protein and give it a score out of 10. These results came as a surprise. This was not because Optimum Whey Gold failed to blow everyone away, but because we did not expect our testers to have such big differences of opinion. While it is generally accepted that people have different taste buds, we did not expect chocolate flavoured drinks to be so divisive! When we average things out it becomes clear that there is not a great deal of difference between the scores given to the proteins overall, but that scores given to each protein differ markedly. A good example of this variation in opinion is that two out of four of the proteins were rated both as someone's favourite and another person's least favourite. Protein two emerged as the clear winner, because nobody gave it a low mark, although it was well regarded - the "creamy" texture of this casein-heavy blend was mentioned as a positive a number of times. Low marks were given for a number of reasons. Protein 4 and ON Gold Standard both earned a 1/10 for tasting "sour" to members of our panel, while others referred to these same proteins as "inoffensive" and even "sweet". Protein 1 lost marks for tasting "artificial and bitter" according to one respondent, yet another described it as "easy to drink". It is important to realise the limitations of such a small test. One shortcoming of this exercise is that a taste test is a bit different to drinking a whole serve of a protein, which is a more accurate reflection of the way protein would normally be drunk. In spite of this, we're pretty confident that we still would have seen a wide range of taste preferences. As the old adage says: "one man's meat is another man's poison". Optimum Nutrition 100% Whey is not going to be everyone's favourite protein - Some will love it, some will hate it - but in general it is well received by most people. At any rate, Optimum Whey Gold is not getting by on flavour alone. People are responding not only to the taste, but to the quality, formulation, and the results they get using this product. It is clear that the flavour is certainly not doing any damage to the runaway popularity of the number one protein on the market, Optimum Nutrition 100% Whey Gold!